On December 14, 2011 December 14, 2011 By AngeliaIn Life is what you make it. And what they do to make it right. 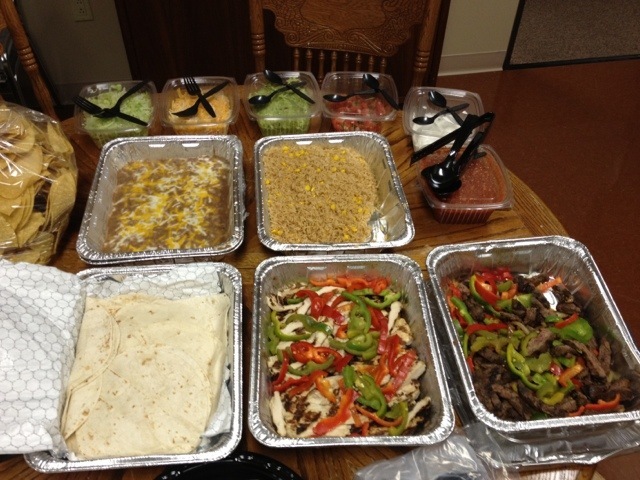 Not too long ago, we had On the Border cater lunch in our office. It was a special occasion from our car rental companies that were visiting. I LOVE On The Border. 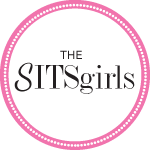 They are based in Dallas, Texas. They serve some of the best texmex and fajita fare in the metroplex. I have been a fan since 1990 when I moved here. 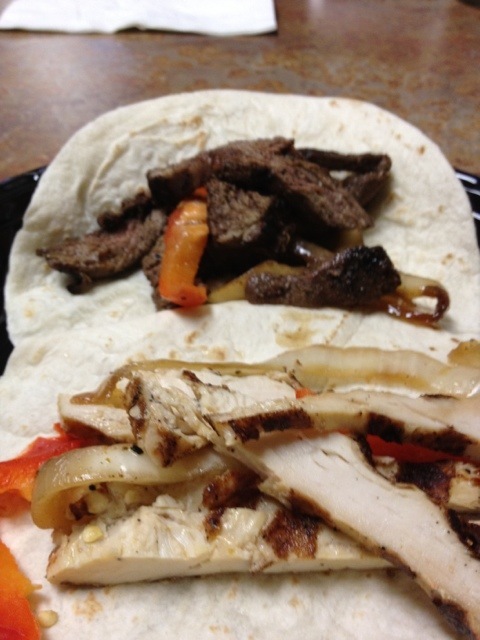 So the day they were catering fajitas, I was over the moon. Like everyone, my mouth watered at the smell. I could not WAIT to chow down. 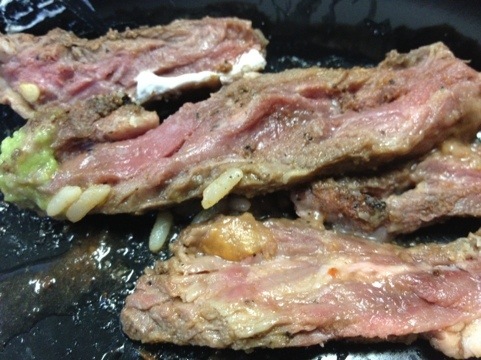 So I filled my plate and brought it back to my desk…that’s when I noticed this (gross warning). My stomach churned a bit because that meat looked funky. I poked it with my fork to see if it would moo, but it didn’t. The chicken looked fine, but the beef? Gads, it was not medium rare. It was simply not cooked. I like medium rare. I like a little pink. But fleshy purple? Not a fan. I heard the microwave whirring from the kitchen as others decided to cook their meat a bit. Another co-worker commented they were not eating the meat as it is too raw. I looked at my plate again, and for once, lost my appetite. I took a few bites of the chicken fajita, but my stomach was in knots. Me, the master of mexican food, did not feel like eating. I was disappointed. I would have expected a catering manager to check the food before going out. To deliver food looking that gross just seemed unheard of. Not one to speak-up, or send food back at resturants, I did something completely out of character for me. I called them and complained. The manager Brady “heard” me and said he would get back to me. I even emailed him the raw meat picture. A few hours later…..no word back. So I did what any good consumer would do. I used the power of Twitter. I tweeted about the event to my 1,116 followers. And they did hear me then, I got a responding tweet to call the corporate headquarters the next morning. So, i did just that. The person that answered the phone knew who I was. She had been “alerted” about the tweet. I told her the whole story. She promised to look into it and notify REGIONAL managers. Within two minutes of hanging up, I recieved a call from Brady, the manager, I talked to the day before. He said he had authorization to do whatever would make me happy. A refund or a re-order. Rather than a refund, I agreed to the re-order for us. It came the next day deliverd by Brandon the catering manager. He asked for me and apologized in person for the raw meat. He was very sincere and gracious. On the Border really did respond to my concerns, and not only was the meat cooked to perfection. Everything was perfection. The entire order was redelivered. 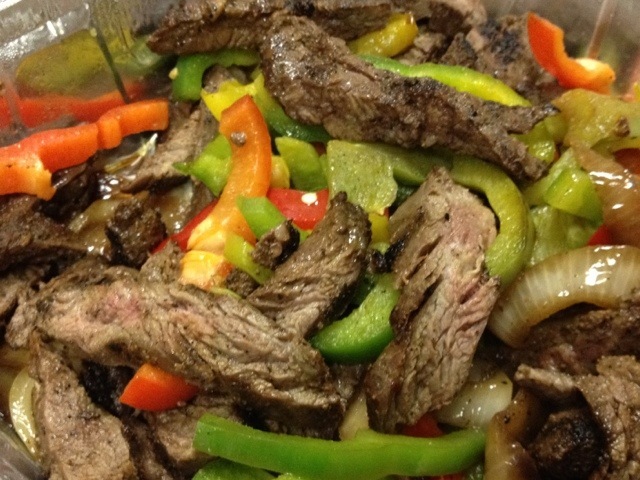 These are the fajitas I know and love! 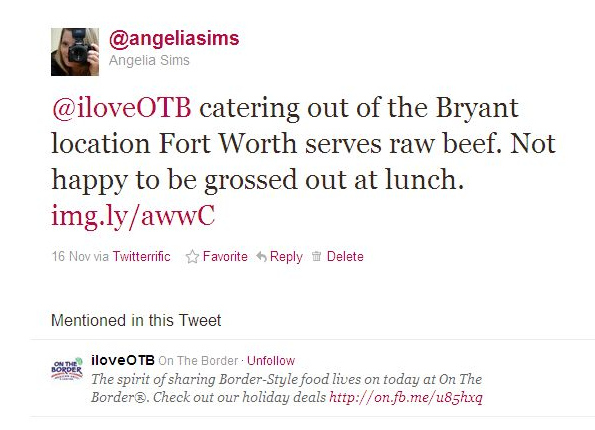 I bring this up today because we just ordered fajitas for the office today. From guess where? Yep! Same place. They remembered us (me) and had strict orders to make sure we were happy before we left (I was!). Again, everything was perfect, professional, and delicious. Not many people take the time to address when a company makes good, but I am. They deserve credit for being a company that stands behind their service and quality. If you haven’t been to On the Border before, and have one in your area, I highly recommend them. And if you are a company with catering needs, I suggest using them for wonderful texmex and great service. I can’t thank them enough for reaching out to me and roasting closing the gap from my experience. Heh. I, and my company, will not hesitate to use them again (like we did today!). And now? Maybe I’ll speak up more often (and tweet). All pics taken with my iPhone 4S. Thats awesome. So many companies dont get that a complaint is a great opportunity to make a repeat customer if its handled well! Its super to hear that a company responded well , and made things right. Go you. Go them! Fantastic that your tweet got a response! The 2nd meal with cooked beef looks fantastic. Wow, night and day between those two photos! Ahhh the power of social networking…aka, Twitter. Haha love it. What I love even more is that they corrected their mistake. Glad they made good on it…see everyone benefitted in the end! Man…in the summer I ordered McDonalds. Of course my husband and son had already plowed through their meals. I was just about to start my burger when something fell out. It was a fried bumble bee. I immediately went on twitter and within seconds, others retweeted and retweeted and then I got a message from McDonalds asking me for my number. They called and well, lets just say I got my money back and some goodies. The power of social media is strong! Yep…still glad I’m a vegetarian. Oh my, what an experience. I’m glad no one got food poisoning and that it worked out well in the end. When cooked properly it certainly does look delicious! Nice work! Companies these days have absolutely no room to avoid customer service. Back in the day, they could brush you off and nobody would know. Twitter, Yelp, Facebook, etc. has changed the customer service game drastically! Mmm…the reordered lunch looks much better! Definitely speak up. My husband is just realizing that he is spending HIS valuable money at their restaurant and his food should be the way he wants it. You should’t have to pay for something less than what you expect, most especially wrongly cooked meat. That first picture? It really was awful. I’m glad that they are bending over backwards to do you good now. I really am. So, the squeaky wheel DOES get oiled! Glad they made good on it! Omg! Good thing it wasn’t in a sauce or something where you couldn’t see it. I love tex mex and the after pics look great! Sounds as if what happened may have been an oversight somehow. What a nice idea to have lunch catered to the office. Although an office full of hungry disappointed people sounds like trouble to me! I LOVE On the Boarder! I am soooooooo happy to hear they did something to make it better. Yum!